The National Peking Opera Theatre of China will take you back to the country's oldest local opera in its latest production, "No 1 Scholar Zhang Xie" at the N Theatre in Beijing from Thursday to Sunday. About 800 years ago, scholars in Yongjia (today's Wenzhou), in East China's Zhejiang Province, turned the story of an inconstant man into China's first play script "No 1 Scholar Zhang Xie." Long believed lost, the script was rediscovered by a Chinese intellectual Ye Gongchuo in a London antique shop in 1920. Ye had bought a lost volume of the famous Ming Dynasty (1368-1644) "Yongle Encyclopedia with Annotations," which contained the script. "It is the oldest and most intact of extant Nanxi scripts and the one that retains the greatest number of the genre's original features," said Wu Jiang, president of the National Peking Opera Company. The production will also feature acclaimed drama director Lin Zhaohua, whose familiarity with avant garde modern drama adds a fresh touch to the old plays. "We have managed to strike a balance between authenticity and innovation, between sophistication and popularization. We hope audiences will catch a glimpse of Chinese operas yesterday, today and tomorrow through the show," he said. Nanxi, or Southern Opera, a multiple-act form of play that emerged in Yongjia, is considered the earliest theatre genre in China. Also known as Yongjia Zaju or Wenzhou Zaju, the relatively crude art form features most of Chinese local opera's characteristics, telling a complicated story through singing, speech, acting and dance. 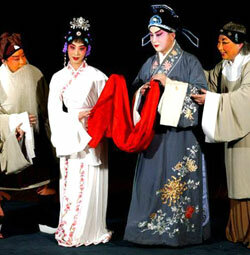 One main feature that distinguishes the original Nanxi from today's local operas is that a performer of hangdang (characters) plays several roles in one opera. The Peking Opera version of "No 1 Scholar Zhang Xie" retains this traditional feature. Its five key performers are Jiang Qihu, the sheng or male character, Li Haiyan, the dan or female character, Liu Jinquan, the jing or painted face character, Zhen Jianhua, the mo or secondary male character, and Kong Xinyuan, the chou or clown. They play a total of 20 roles and even act as stage props and parts of the set. For example, in one scene, the mo and jing play the neighbouring couple and the chou plays their naughty son. In another scene, which describes how Zhang seeks refuge in a temple after being assaulted by bandits, the jing, mo and chou play the parts of a deity, a judge from the underworld and a minor demon, respectively. The three improvise and indulge in buffoonery to great comic effect, with the mo and chou even serving as the two panels of the temple door. The new production also takes on some other features unique to Nanxi - having the mo character narrate the play at the beginning and sing in the zhugongdiao melody to describe the plot. Kong Xinyuan, the veteran chou actor said the tunes used in "No 1 Scholar Zhang Xie" come from popular folk songs and chantefables such as zhugongdiao and changzhuan, religious music (Buddhist and Taoist), court music and poetic rhymes from the Tang and Song dynasties. "Actually, the music and melodies of Nanxi were mainly compiled from the well-known tunes, local songs and village ditties of the time," Kong says. Both Li, a leading actress of the Cheng School (Cheng Yanqiu, 1904-58, a popular Peking Opera actor who played female roles), and Jiang of the Ye Schoo (Ye Shenglan, 1914-78), are rising performers who follow their masters' styles but add their own distinctive characteristics at the same time. Jiang, 40, started his career in a local Peking Opera Troupe in East China's Jiangsu Province. After he became a member of the National Peking Opera Theatre, Jiang enrolled in graduate courses in the Academy of Chinese Local Opera. Recently, he has expanded his repertoire to include international theatrical works, performing in Greek drama, Japanese Noh and Chinese composer Guo Wenjing's opera "Night Banquet." However, all his ventures into other forms have not undermined his love for Peking Opera or his outstanding performances of traditional Chinese theatre genres. "Peking Opera, like many other genres of China's traditional performing arts, is facing a tough challenge these days as we try every means to compete in the fast-changing entertainment world. Many people are experimenting with modern reforms to these centuries-old arts. This new version of China's oldest play is one such experiment," said Jiang.